Cushing Academy is home to one of the most highly respected Visual and Performing Arts programs in secondary school education. Our departments offer classes in a variety of disciplines to suit the interests and meet the needs of students at every level. Visual Arts options include silversmithing, ceramics, painting, drawing, architectural design, photography, and stained glass. Performing Arts courses include dance, theatre, jazz ensemble, chamber music, and chorus. We are excited to welcome teachers from junior boarding and day schools throughout the northeast for a fun-filled day of professional development. 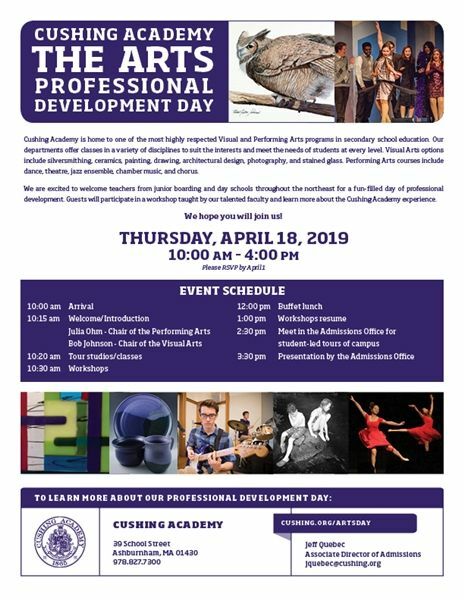 Guests will participate in a workshop taught by our talented faculty and learn more about the Cushing Academy experience. Please submit one entry per person. Please rank your preferred class (on a 1-5 scale, with 1 being the first choice) for either Visual Arts OR Performing Arts. Each attendee will then be placed in one workshop for the day, based upon availability. Please note that class size will be limited. Cushing Academy exists for students and develops curious, creative, and confident learners and leaders. Founded in 1865, Cushing is a co-ed, college preparatory boarding and day school for students in grades 9-12 and PG. Our students, who come from over 30 states and 30 countries, excel in our outstanding academic, art, and athletic offerings. We welcome you to visit our community and beautiful 162-acre campus in Ashburnham, Mass., just one hour from Boston, to experience all that Cushing has to offer.